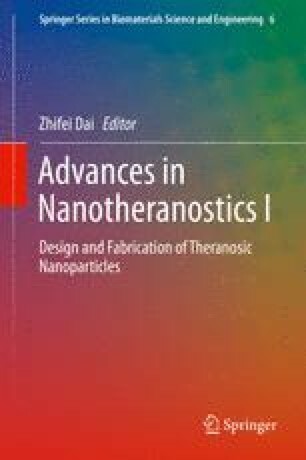 Gold nanorods (AuNRs) are an important type of noble metal nanoparticles with some superior performances, such as easy synthesis, easy modification, excellent biocompatibility, tunable surface plasmon effect, and photothermal and photodynamic effects. They have been proved to be promising in a wide range of biomedical applications such as biomedical imaging, photothermal therapy, photodynamic therapy, and drug or gene delivery. Because the longitudinally localized surface plasmon resonance absorption of AuNRs can be easily adjusted to the range of near-infrared (NIR) light which can penetrate deeply into human tissues with minimal invasion, AuNRs as great nanocarriers and imaging agents reveal a great application prospect for photoacoustic tomography, photothermal therapy, or NIR light-mediated theranostic platform. Herein, we begin this chapter of AuNRs by summarizing their synthesis methods, surface modification, and functionalization, then we describe their optical properties. Besides, we focus on the recent progress in diagnostic, therapeutic, and theranostic applications of AuNRs in cancer. This work was supported by the National Nature Science Foundation of China (81401452 and U1432114), Hundred Talents Program of the Chinese Academy of Sciences (2010-735), and by Key Breakthrough Program of Chinese Academy of Sciences (KGZD-EW-T06), and Ningbo Natural Science Foundation (2014A610158).